The Diopsys® NOVA VEP Vision Testing System is a non-invasive medical device used to help your eye doctor objectively measure the function of the entire visual pathway from the lens of the eye to the visual cortex of the brain. The test is painless and does not require dilation or sedation. The Diopsys® NOVA Systems are the only objective visual testing devices designed for the eye care professional’s office capable of evaluating the entire visual pathway available today. How it works: After positioning three sensory pads on the patients head, an operator initiates the test. A series of black and white patterns that appear to “flip” quickly over and over again is presented to the patient on a computer screen. The eye specialist may vary the pattern size, frequency, contrast, time, and eye tested. 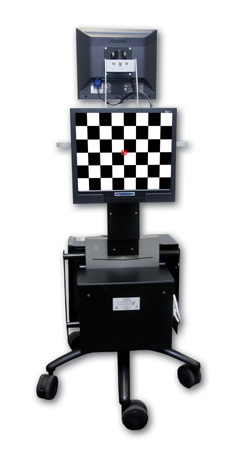 The results may then be displayed to generate a profile for each eye (displaying responses to several size stimuli), or compare VEP studies to assess therapy (patching, drops, lenses, prisms, and other modalities). See our Diopsys® NOVA Patient Brochure for more information. Click here for the Spanish version. Who are we testing and what are we testing for? We are testing children six months of age and older, patients following a neurological event such as a traumatic brain injury, stroke, or a degenerative process such as multiple sclerosis in order to help the clinician detect visual deficits such as optic nerve disorders, amblyopia and other neuro-visual disorders.